One of the greatest of human puzzles has always been the concept of life. While we understand the physiological components of life, the actual animating force remains a mystery. Lacking scientific understanding early humans devised a number of explanations to answer this mystery. Very early they developed the idea that some form of life force, an invisible life-giving energy was present in humans, animals and plant life. Some cultures even believed that the rocks, the mountains, and the Earth possessed this life giving energy. Many different ideas evolved concerning this mysterious energy, but essentially it was viewed as a force that came down to Earth from the heavens. Just as tides waxed and waned by the influences of the Moon, so too it was believed, this force influenced everything in heaven and on earth including humans. One of the earliest ideas was that this energy was somehow contained within the blood. Primitives seeing blood flow from a wounded animal or another human, and their subsequent death, assumed that the blood, or something in the blood, must give life to the body, and when that vital substance escaped, death followed. A later idea was that this energy was contained in the air. Humans noted the power of the wind to move objects, so it made sense to them that air contained some mysterious life giving power. Humans also made an early connection between breathing and the air. It must have seemed logical to make a connection between air and life, for they would have observed that when one stopped breathing they died. Later, when humans created deities this supreme power was perceived as a pre-existing force that animated the cosmos and brought order out of chaos; it gave birth to, and "animated" the Cosmos, then it created the gods. Because the gods were filled with this cosmic energy they too had the power to create life. So it was accepted that the gods used their power to create life. They had taken some inanimate material, usually clay is mentioned, shaped it into humans and animals then, breathing into it they made it alive. This idea is expressed in Genesis 2:7; Then the Lord God formed a man from the dust of the ground and breathed into his nostrils the breath of life. Even today, we still use the term, "the breath of life," to refer to life. To the ancient Greeks this energy was either Nous, Apeiron or Pneuma. Nous was the purest, most powerful substance in the cosmos, possessing universal knowledge, with power over all living things. Apeiron was the fifth element, able to take on the properties and shape of any substance. It gave life to the cosmos, to, all the heavens and the worlds within them. [Anaximander] The Logos, or Pneuma, (literally meaning, the "breath of life"), the substance mentioned in the New Testament, (John 1), was believed to be a universal substance animating the whole universe. To the Hindus and Buddhists this energy was called Prana, a form of breath, or a life-current. The air itself was thought to conduct this subtle energy, and, as we breathed, we drew this force into our body. To the Chinese this mysterious energy was known as Qi, or ch'i. Ancient texts mention eleven mo or body vessels, which were believed to contain blood and ch'i. An essential part of most of these ancient theories was that this vital energy "flowed" through the human body in special "channels" in much the same way that blood flowed. The Chinese called these channels, "meridians", and the energy flow was known as the sheng or ko cycles. Over time these concepts became more sophisticated, so that Ayurvedic Medicine evolved a complex system of sixteen separate channels (srotas) existing on both a visible and invisible level. These included channels through which intelligence flowed, and another that channelled the flow of thoughts through the mind. It was the flow of this energy that controlled one's health. Good health depended upon the unrestricted flow of this energy through the body; it was vital that the channels be kept open. Blockages of the channels in any part of the body would cause an imbalance, resulting in illness to that part. Thus, for the Chinese, good health was attributed to a regular flow of ch'i, while both physical and mental ill health was blamed upon excesses or deficiencies in ch'i, or caused by blockages of the flow of ch'i in various meridians. More widespread blockages in many parts of the body could cause the energy flow to be so restricted that serious illness could occur throughout the entire body, and if the blockages were widespread and severe enough, this could result in the death of the individual. To overcome such blockages and maintain a healthy flow of energy the various techniques developed their own treatment techniques. This then was the basis of the many concepts that later claimed to utilize the various energies to balance them, or to remove internal blockages so as to restore the individual to good health. For instance, in acupuncture, the treatment involved inserting needles into certain acupuncture points to remove the blockages, and restore the flow of ch'i in and out of the holes in the skin where it "lived." * Ayurvedic Medicine: Focuses on establishing and maintaining balance of the life energies, rather than focusing on individual symptoms. * Naturopathy: Claims that illness is caused by an imbalance of a vital life energy, and claims to be able to restore this balance through diet, etc. * Pranic Healing: Using the hands to detect holes from which the prana, (the body's life force), may be escaping, and "sealing" these leaks. * Toning, releasing the "god-energy" when we become attuned to the music of the spheres. Practitioners of these and many other alternative forms of therapy claim to utilize various energy forms which can produce physical and mental healing. Indeed, they go to great length to convince people of the legitimacy of their particular form of healing abilities, to the extent of "dressing-up" these "therapies" with pseudo-scientific claims. However, despite their claims, the fact is that none of these so-called "energies" have any scientific basis, for they simply do not exist. 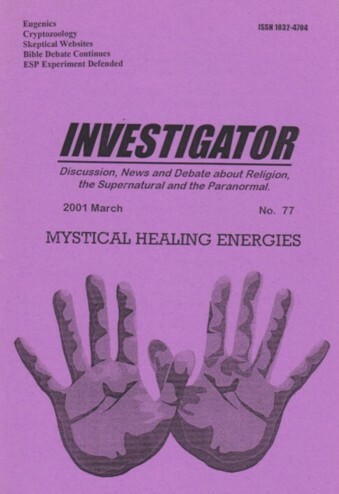 Despite the fact that science has known of, and studied numerous forms of energy over hundreds of years, with the exception of magnetism, the so-called energy forces touted by alternative therapists remain undetectable. Alternative therapists would have us believe that this is because of the ethereal nature of these energies! This is ridiculous. The fact is, if they existed they would be detectable! All light, electrical and magnetic energies are part of an extremely well-studied spectrum. Modern instruments can detect the most subtle forms of energy, yet scientists have been unable to locate any of these "mysterious energies". The reason for the inability of scientists to detect these "mysterious healing energies" is quite simple; it is because they do not exist! They are the ploys of con-merchants and individuals who are deluded. Many patients claim to have been helped by these various forms of alternative therapies and it is reasonable to examine why these remedies can sometimes be effective. Basically, the positive effects of these treatments are part of a placebo effect, the patient's belief that the therapy will help. It is not only unwise to depend upon such therapies, it is also dangerous, especially when serious illness is involved. * Their treatments and medicines are extremely expensive. One of the dangers of dealing with these charlatans is that for reasons of personal power, ego and fear of being exposed as quacks they discourage their patients from seeking proper medical help. As a result serious health problems may go undetected. It is a travesty of modern health legislation that anyone can set up a practice and commence to "treat" patients.